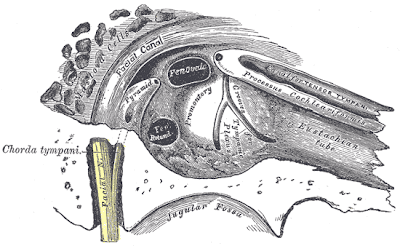 This image, taken from Gray's Anatomy, is a view of the right-sided middle ear space with the external ear canal, eardrum (tympanic membrane) and hearing bones (ossicles) removed. The observer is looking at the medial wall of the middle ear, as seen from a lateral viewpoint. The facial nerve is seen to pass horizontally in a path superior to the middle ear, and then turn in an inferior direction and then pass vertically posterior to the middle ear. The Eustachian tube extends anteriorly and is directed inferiorly as its path towards the throat (nasopharynx) extends further from the middle ear. The jugular fossa is inferior to the middle ear space.